Download app to track the shuttle van. 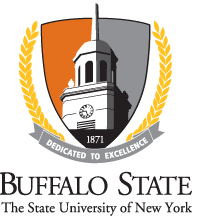 Any available updates on ongoing construction or changing traffic patterns in the areas surrounding the Buffalo State campus on commencement day will be posted here. Parking on campus will be free and ample the day of Commencement. Once on campus, signage will direct you to general parking, handicapped parking, barrier-free entrance drop-off, and building entrances for guests, graduates, and barrier-free access. The ceremonies take place in the Sports Arena, building 39 on 3D map. The live streaming viewing is in the Campbel Student Union Social Hall, second floor of building 8A on 3D map. The receptions take place in the Campbell Student Union, first floor of building 8A on 3D map. Where will my graduate be seated? Bachelor's students will be seated by Academic School. Use this list to determine school by degree. Then view the bachelor's ceremony maps to see where schools will be seated. See 9 a.m. ceremony map and 1 p.m. ceremony map (to be posted). Master's degree students will be seated by Academic School. Use this list to determine school by degree. Certificate of Advanced Study (C.A.S.) students are seated as a group. View the master's/C.A.S. ceremony map to see where schools, multidisciplinary, and C.A.S. will be seated. Please know that, depending on how many graduates participate from any one school, there may be a bit of overflow of graduates seated on the other side of the aisle.